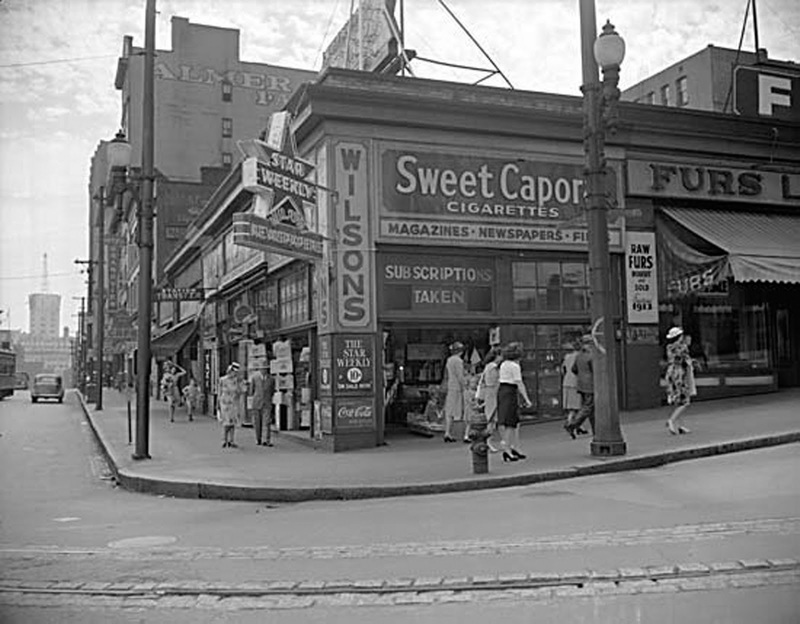 In the 1940s, the downtown corner of West Cordova and Granville hummed with activity. The train station was across the street and the main post office next door. Wilson's newsstand is next door to Lando's Furs. City of Vancouver Archives photograph, CVA 1184-3272. 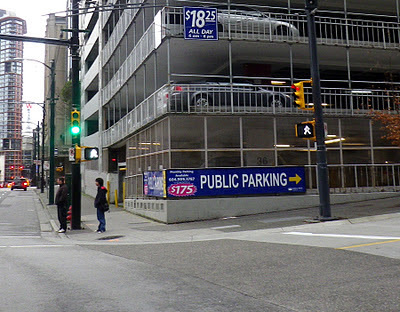 The garage is a utilitarian wonder, a concrete box standing seven storeys tall on a downtown Vancouver street corner. An interior series of ramps winds to the rooftop, where painted stalls provide room for yet another 58 automobiles. From that roof one can marvel at the neo-classical beauty of Waterfront Station across West Cordova Street, as well as the mixed art deco and Edwardian Baroque magnificence of the Sinclair Centre across Granville Street. It is much better to be in the garage looking out than to be outside looking in. The garage, built in 1969, is an ugly, dreary blot on the landscape. The garage’s opened facade is like a grim stack of grey concrete pancakes. The site was not always so unwelcoming. Once, a strip of mom-and-pop businesses operated on the block. A photograph taken during the war years depicts well-dressed couples strolling past businesses with opened doors. The two images — the sterile parking garage and the vibrant street of shops — are paired in a fascinating new blog called Changing Vancouver. The site matches then and now photographs taken at the exact same location. Launched on Christmas Day, the blog already has more than 50 entries complete with historical background and information on architects and builders. It is an irresistible time waster. The blog is produced by Andy Coupland, a London-born City Hall planner, and John Atkin, the historian and heritage advocate. It is a followup to The Changing City, their book of walking tours published last year by Stellar Press. The contemporary photographs are shot by Mr. Coupland (pronounced coop-land), who strolls city sidewalks armed with a digital camera, a tripod, and a wallet of black-and-white prints as he seeks the precise spot where the historical photographs were taken. It is not as easy a task as it sounds and even somewhat hazardous. Sometimes, the before-and-after images are surprisingly similar. (A trio of buildings facing the northeast corner of Victory Square remains intact.) Other times, it is hard to imagine what has forever disappeared. That ordinary, ho-hum, never-give-it-a-second-glance Standard Life Building office tower at Howe and Dunsmuir? It stands on ground once occupied by the many-gabled Manor House Hotel, which boasted a wraparound porch on all three levels, as well as a bell tower overlooking the intersection. The Manor House was designed by William Blackmore, a British-born architect who skipped debts in Winnipeg and Minneapolis to set up practice in Vancouver a year after the city was founded. 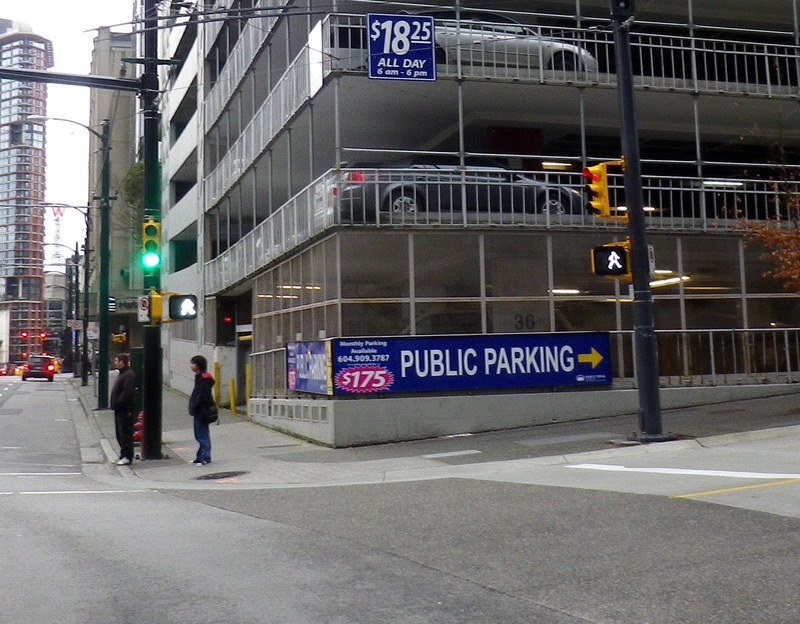 One of the blog’s most shocking contrasts is the pairing of today’s parking garage with yesterday’s modest shops at the corner of Granville and Cordova. “That single story is so much more interesting than the parking garage,” Mr. Coupland said. In that one block, now relegated to memory, can be told the story of a city. Along Granville Street could be found a lunch counter and an office of the Railway Express Agency, which shipped parcels. There was also a barber shop operated by James Willows; the Wigwam novelty store offering native crafts and Japanese porcelain; and, a furrier. The corner was occupied by Wilson’s, described as the Post Office News Stand in the city directory. A star-shaped neon sign advertised the Star Weekly magazine, while other exterior signs promoted Coca-Cola and Sweet Caporal cigarettes. The newsstand is open to both Granville and Cordova Streets, attracting customers from the train station (now Waterfront Station) and the post office (now Sinclair Centre). The adjacent fur store was founded by the Lando family. Lou and Sara Lando’s son, Esmond (Bud) Lando became a prominent lawyer and sportsman in the city, while his wife, Edith, was named to the Order of Canada as a “quintessential volunteer.” Their children are known for their own volunteer and philanthropic works. One of them, Barry Lando, worked for a quarter-century as a producer on CBS’s 60 Minutes. All of which is more interesting than a parking garage. While the blog has so far used archival photos, Mr. Atkin is dipping into his extensive collection of private, never-before-seen photos dating from more recent decades. Among these is a 1962 shot of the Courtesy Kitchen, serving Chinese and Canadian food, at the corner of East Broadway and Scotia. Next door, a one-time foresters hall houses a shop selling foam. Today, both buildings have survived. The former Courtesy Kitchen is now home to the pleasant Rhizome Café, while the foam store, which has also been a confectionary, a print shop and a strip joint, is home to Starbucks. At least it was the last time I checked. In Vancouver, you never know what’s going to be there in the morning. Since 1969, a dreary parking garage has snuffed the vibrancy from the same intersection. Andy Coupland photograph. A large crowd gathered at the Jewish cemetery in Victoria after unknown vandals defaced headstones with swastikas. Chad Hipolito photographs for the Globe and Mail. 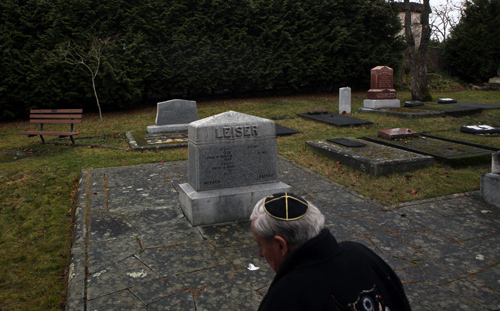 An unknown hand perpetrated the unthinkable — painting swastikas on headstones in a Jewish cemetery. It was a criminal act and a cowardly one, too, a desecration designed to disgust and perhaps to intimidate. There is disgust. There is no intimidation. On a grey Sunday afternoon, people came in their multitudes to gather on hallowed ground on a hillside overlooking the city. They filed past a gatepost bearing the Hebrew inscription Bais HaChayim (house of the living) before gathering around a memorial to the Holocaust. 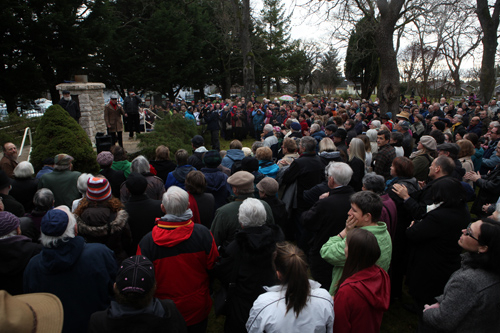 More than 600 came for a vigil. 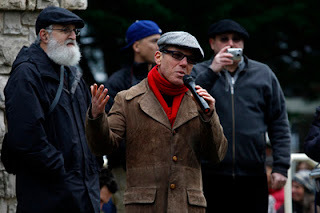 “All of us coming out here and standing together means we will not be silent in the face of a hate crime,” Rabbi Harry Brechner of the Congregation Emanu-El synagogue told the crowd. In the new year, a removal agent was applied to the monuments, which were wrapped in a see-through sheet. It gave them the appearance of having been wounded in battle. The wrap is now off, the blotched areas on which the solvent had been applied looking like scars. Each of the vandalized headstones tells a story. The most modest of the damaged ones is adorned not by a Star of David but with an engraved maple leaf. It marks the wartime burial site of Joseph L. Vince, a 44-year-old private with the Royal Canadian Regiment, who died of heart failure in 1915. Nearby is a small granite marker for Annabelle and Eli Beam, a couple who lived at 15 Linden St., one house from the Dallas Road waterfront in Fairfield. He owned two businesses on Wharf Street — the Pacific Sanitary Bag Co. and the Victoria Junk Agency. He died in 1940. Her death date is now obscured. The stone awaits further repairs. A monument of pink granite honours Charles A. Freedman, a theatre manager who had made his fortune in the Klondike gold rush. One March evening in 1908, he returned home from a night at the theatre with his wife when he stumbled across a prowler in the pantry. The men struggled, the intruder pressing a rusty .38 revolver to the left side of Freedman’s chest before pulling the trigger. The wounded man chased his attacker out of the house, then fell, mortally wounded. “Marion, I’m shot,” he told his wife. “I’m done for.” He died minutes later. The other damaged monuments mark the resting spot of three brothers and their families. Born in Germany, they made their fortunes as merchants on the Pacific coast. The eldest was only 23 years old when he got a contract to build a trail from the Stikine River to the Cassiar gold fields, along which he collected a toll of two cents per pound of freight. Simon Leiser and Company became the province’s largest grocery wholesaler with several stores in the mining towns dotting Vancouver Island. In 1896, he built a red brick warehouse at 524 Yates St. alongside Waddington Alley in downtown Victoria. The building still stands. 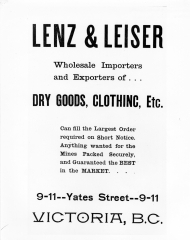 An advertisement for Lenz & Leiser. His brother Gustav went into business here as a dry-goods merchant, while Max, the younger of the trio, imported wines, liquors, and cigars. Gustav died unexpectedly of pneumonia, aged 40 in 1896. Max later built a handsome, four-story brick building at the corner of Blanshard and Johnson Streets. (Today, the ground floor is home to the Shine Cafe.) It was called the Kaiserhof Hotel and boasted a beer garden at the rear. In 1915, the civilian passenger liner Lusitania was torpedoed by a German U-boat with great loss of life, including James Dunsmuir Jr., the 21-year-old scion of the Vancouver Island coal-mining fortune. News of the sinking enraged a crowd of men in Victoria. Led by soldiers in uniform, a mob numbering 500 attacked the Kaiserhof, since renamed the Blanshard Hotel. The bar was trashed. Another $25,000 worth of damage was done to Simon Leiser’s warehouse. Other businesses owned by those with German names, many of them Jewish, were also attacked. It mattered not at all to the frenzied throng that the Leisers, prominent in the arts and business in Victoria, had long since become loyal British citizens. A century ago, a mob acted in mindless fury. The recent vandalism reflects a similarly ugly spirit. On Sunday, another large crowd — this one motivated by love, not hate — gathered around the graves of people named Beam and Vince and Freedman and Leiser. The grounds of the Jewish cemetery were consecrated in 1859, desecrated in 2011, venerated in 2012. Repairs were made to the headstone of Simon Leiser, who built a wholesale grocer business in the province by supplying prospectors and mining towns on Vancouver island. 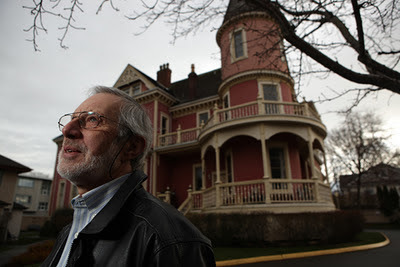 The author Nick Russell stands in front of Pinehurst, an 1889 mansion in Victoria's James Bay neighbourhood. Chad Hipolito photographs for the Globe and Mail. The block on which Thomas Donovan built his family home included three carpenters, two laborers, a butcher, a saddler, a plasterer, and a letter carrier. It also boasted a bricklayer. You only had to look at the exterior of No. 23 Milne St. to know where he lived. In a city surrounded by forest, with mills lining the waterways and timber both plentiful and cheap, Mr. Donovan built his home of red brick. It has a hipped roof and cross gables, as well as a patterned frieze separating the ground floor from the second. The home is a spectacular testimony of a craftsman’s skill. The records suggest it took him three years and $2,000 to complete by the time his family moved in 110 years ago. The Donovan house is one of the homes featured in Glorious Victorians, an illustrated book celebrating the capital city’s stunning stock of notable private residences. The book’s subtitle promises 150 houses to mark the city’s 150th birthday this year, with entries from castles to cottages, and in architectural styles ranging from Queen Anne Revivals with their fussy gingerbread woodwork to art-deco wonders of sleek, curvilinear shape. As the capital of a province dependent on natural-resource industries, with dramatic boom-and-bust cycles, it is a wonder so many remarkable homes have avoided the wrecking ball. Victoria has lucked out. After the gold rush, the booms were never too loud, nor the busts too desperate. Where vast swaths of Vancouver have been leveled, grand private homes replaced by apartment towers in the West End and modest cottages torn down for Vancouver Specials, the capital’s steady growth left intact an inventory of homes spanning a century-and-a-half of favoured styles. A charming streetscape is one of Victoria’s understated lures. His research has found worthy homes in all corners of the city, including a cottage along the harbour waterfront that is all but invisible from the street, hidden as it is behind a curtain of trees. It can be spotted from the water if one looks down from the deck of the passing MV Coho ferry. His favourite street for house sightseeing will come as little surprise to anyone familiar with the city. Mr. Russell, 73, has renovated two houses since moving to Victoria from Regina more than a decade ago. The first was a homestead-style house covered in stucco and in disrepair as a longtime rental. During the renovation, it was learned the house dated not from 1900, as thought, but from 1861, when it was built for one of the first African-American families lured to the colony by Gov. James Douglas. The second is his current home in the James Bay neighbourhood. It is known as the Mansard House for its roofline, an uncommon style in Victoria. 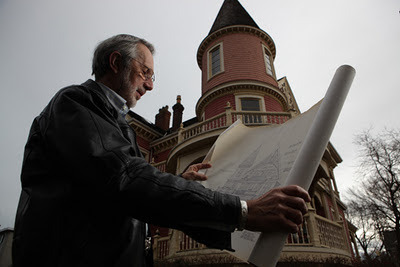 He did not include it in his self-published book, as the house once had been lifted to make room for a full basement, losing the original integrity of the design. He and his wife, Sharon, worked on the restoration, which received an award from the local Hallmark Heritage Society. The longtime reporter and educator trained many of the reporters whose bylines can be read in British Columbia newspapers. As well, he wrote Morals and the Media, a book on ethics in journalism. (Insert your own wisecrack here.) He was senior editor of This Old House, a four-volume register of Victoria’s historic homes produced by the Victoria Heritage Foundation. Working with other researchers, Mr. Russell picked through the detritus of city hall’s attic and found dusty ledgers with valuable information for those interested in researching house histories. So far, he has gathered 3,600 plumbing permits, 6,450 water permits, and 8,218 building permits, a dreary accumulation of data for the uninitiated but a trove of detail for researchers. The goal is to have this information made available online. An advocate of preservation, Mr. Russell does not want Victoria to become a time capsule. A city is living space for people, he notes, not a museum. Nick Russell checks out the architectural drawings for one of Victoria's spectacular homes. Professional hockey made its debut on Vancouver Island at this magnificent arena in Oak Bay on Jan. 2, 1912. 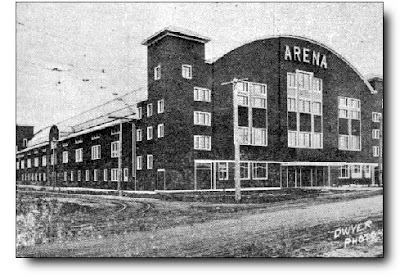 The arena was one of two built by the innovative Patrick brothers. The Arena burned to the ground on Nov. 11, 1929. Modest apartment blocks have been built on its site. The arena opened to great fanfare. A ticket was sold for every seat. The standing-room area was packed to the building’s timber rafters. A band struck up the national anthem when the lieutenant-governor entered the building. The hockey teams skated onto the ice, the home side first, followed by the visitors. The vice-regal officer then stepped onto ice made hard and cold by an ingenious system of pipes beneath the surface. Thomas Wilson Paterson, a railway contractor and former politician, dropped the puck for a ceremonial opening face off. One hundred years ago today, on Jan. 2, 1912, the exciting sport of ice hockey made its professional debut on Vancouver Island at a new arena built in Oak Bay, just outside the city of Victoria’s borders. “The sport is all it was cracked up to be and more,” trilled the Daily Times after the game. It seems hard to imagine the game now so deeply associated with Canadian identity needed any introduction at any time in the Dominion. Hockey was played in the province, especially in the mining towns in the frozen valleys of the Kootenays, but fair weather on southern Vancouver island only permitted the occasional children’s game of shinny on a frozen pond. On that day a century ago, the seven members of the New Westminster Royals sailed across the strait to play the Victoria Senators in the inaugural game of the three-team Pacific Coast Hockey Association. The modern arena with artificial ice, the three teams and the league were all the product of Frank and Lester Patrick, ambitious and far-sighted brothers who had made a fortune with their father in the lumber business. Both brothers had played pro hockey back east. They figured another fortune was to be made in promoting the sport in Canada’s booming Pacific cities. They also intended to challenge for the Stanley Cup, even then inspiring fevered dreams of hockey glory. In Vancouver, the brothers built a grand, $175,000 arena on Georgia Street overlooking Coal Harbour. It boasted a seating capacity of 10,000, making it the largest arena in the Dominion. Incredibly, the city’s population was just 120,000, though it had doubled in five years. The Royals wore black and orange sweaters, while the Senators sported a red, white and blue combination. The sportswriters wrote in purple. The Victoria arena opened to the public with an offer of free skating on Christmas Day, leading several downtown stores to advertise their new stocks of equipment. James Maynard’s store in the Oddfellows Block on Douglas Street suggested “hockey boots and skates make fine Xmas gifts for all.” Peden Bros. boasted carrying a complete stock of the best skate makers, including Lunns, McCulloch, and Automobile. A pair of McPhearson’s skating boots for ladies costing $3, a pair of Gales hockey boots for men at $5. Victoria lost the first game at the arena by 8-3. 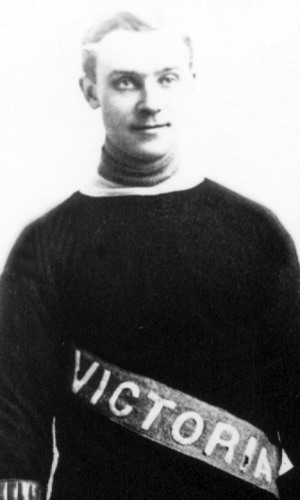 In goal for the home side was Bert Lindsay, 31, who had been lured away from the Renfrew (Ont.) Creamery Kings by the Patricks. Lindsay spent four seasons on the coast before returning east, where he played for the Montreal Wanderers and Toronto Arenas in the inaugural two seasons of the National Hockey League. Lindsay’s son also became a hockey star. Terrible Ted Lindsay is now 86. The Patricks are credited with such innovations as permitting forward passing, adding blue lines, and substituting skaters while play continues. At the end of the short 1912 season, Frank Patrick suggested the Stanley Cup be decided by a series of games, not just a two-game playoff as was the practice. These days, the Stanley Cup finals end in balmy June. And the storied trophy has even been won by a team in Florida. A forgotten arena in Victoria was once the stage that showed how such wonders were possible. 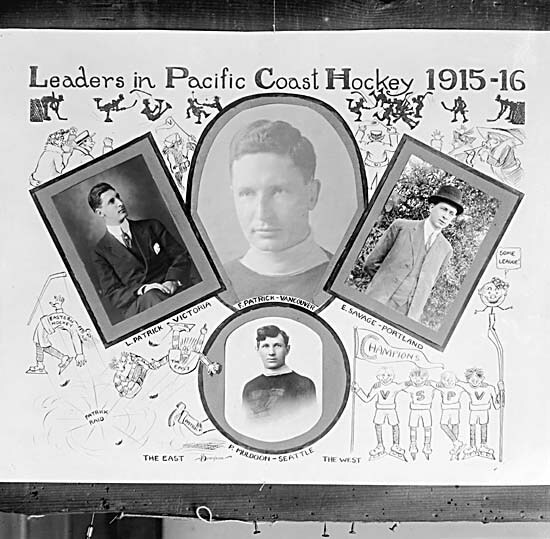 Lester Patrick and Frank Patrick were the masterminds behind pro hockey on the Pacific coast.